I think we can’t really escape the influence of the media so our attention is always a bit guided towards “the hot topic” right now. That could be the Ukraine conflict, Syria or some local killing spree. There is so much more going on right now though. 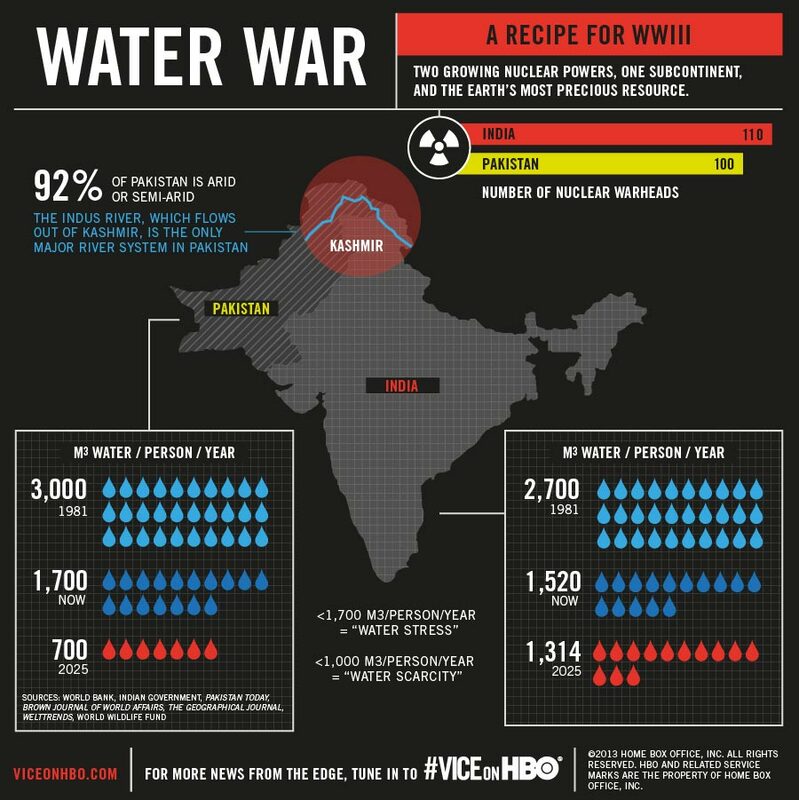 I came across this interesting infographic about the scarce resource of water in the Kashmir region between India and Pakistan. Water and lack of water will make or break everything, much more than lack of oil. But given we have lots of other problems to face right now, it might not even come to that and the collapse happens earlier. There is also a highly rated documentary called Blue Gold – World Water Wars. It is also on Youtube. Wikipedia has some more reasons why we could face a water war rather sooner than later. It happened before. Anyone who believes you can have infinite exponential growth on a finite planet is either a madman or an economist. Do you plan or think about droughts / water war scenarios? ‘Water wars’ have been going on here in the states for some time. Out in the west they are of long standing as agricultural interests fight for water allocation with the ever-growing needs of the cities.Governmental water boards, environmentalists and the various endangered species (like smelt) they try and protect, are constantly engaged in the skirmish for water. In the east states like TN, Georgia etc are constantly fighting over who ‘owns’ and should therefore ‘control’ bodies of water. Aquifers in the Midwest both upper and middle are drying up – more fighting and regulation. As nature and her weather patterns shift and change, vast areas of the country are even now experiencing drought. US cattle herds are at the lowest number since 1956 as ranchers have been selling off their herds for the last few years as they can not afford to feed them and their drought-stricken land can not sustain them. Some of the most productive land (if irrigated) lies fallow, taken out of production as farmers can not get enough water allocated to grow produce. We import more and more food from other countries. Water was one of the top two reasons it took so long to find current homestead. Location the other. As a long time gardner/small farmer in an area that can experience high summer heat and drought conditions some years, access to and multiple sources of water with an origination source on the property itself was critical. As food prices continue to rise, despite the governments continual proclamations that there is really no inflation and the economy is in ‘recovery’, lack of water is already driving up US food costs. Beef all time high, lime shortages, pecan shortages….the American consumer as a whole seems to remain clueless where their food comes from and what it takes to produce it. It should, somehow, just magically appear completely perfect, unblemished and in mass quantities on the grocery store shelves. The country is in for a rude awakening. Nature has its ways of dealing with animals that breed too much , in humans case , its called war ………and its coming again . Especially when a worldwide economic collapse seems unavoidable ……then the shooting will start . We lived about 2 years in southern Idaho, at the north edge of the sagebrush desert. Yes, agriculture is booming, and the fertile volcanic soil produces huge crops of sugar beets, world-famous potatoes, alfalfa, corn, etc. Not to mention supporting huge dairies (6,000 cows–and attendant cheese factories) and beef feedlots. But at the cost of drilling very deep wells and installing costly pivot irrigation systems. Farmers had to have $millions invested in equipment and water. Water wars were constant, esp between large farmers and small property owners. Those who did not have the dollars to invest in the deep wells/pivot systems relied on the old irrigation canals routed from the Snake River upstream, flowing here and there across the landscape. I believe they were built by the Mormon settlers. Having a canal abutting your property did NOT give you water access. If you stole a bucket of precious water from the Canal Co, it was theft. Newbies buying property did not know they had to buy water rights… One couple we knew had about 15 acres and he raised game birds. Their water rights included water from a small canal…however, all of the water was drained by the big farmer upstream. Legal protests, etc were to no avail. They finally sold out and moved to Wyoming. The water in So. Idaho is derived from the snowpack on the Sawtooth Mtns on the north horizon (think Sun Valley ski resort.) The snowmelt sinks under the volcanic rock at the foot of the mountains, slowly flowing south, underground, to the Snake River valley. There are hundreds of gushing waterfalls in the cliffs near Hagerman Idaho where the water emerges to join the Snake. People there have water rights to farm trout. But try and get some rights as a newcomer…not gonna happen. Water is scarce and precious. BTW several of our state governments have forbidden landowners from harvesting the water from their own roofs. Colorado, I think Oregon… It belongs to “the state”. Sounds like old Soviet Russia to me… Not sure what happened to the USA but I don’t seem to recognize it any more. Think about this good and hard ………….the average Russian , is now more free than the average American is . Harder life , yes …………..but infinitely LESS regulated . This report here has a lot of details whats going on with our water and how it is wasted. What is your current water setup at your homestead? We have a well so far and plan so add underground water storage at a different location for rainwater collection. This sounds really bad. Sorry to hear this about your friends. I still believe SHTF before, for whatever reasons. But if we humans can’t find reasons for war soon enough, like you said, water will be the final tipping point. I think the last 20 – 30 years corporate greed and the government that is controlled by those powers has taken over in a lot of western countries. You can still live free there! Just now you have to be rich to be free and buy your rights or lawyer yourself out of any mess. Freedom has become exclusive… thats pretty twisted. Just had chance to watch the movie. Incredibly interesting, thanks for sharing Jay! I have been to Dubai and the gulf region a couple of times in the last years and witnessed something similar, I have never seen so much energy being wasted… They simply do not care with all the oil they still have. About elite versus working class. Even on a global level the leading governments complain that developing nations do not stick to environmental guidelines. I’m all for protecting the environment but when you look back in time, some of the reasons the western world is where it is now, is because we had decades of industrial progress with little regard for our environment. The developing nations simply want to have their turn of this now. They should not, because we know better but this is a problem. Recently some of the major offenders like China are shifting their policies though, because a lot of the richer Chinese escape the smog and pollution and it directly affects people with power now. With their huge investments in renewable energies and the flexibility the government has (by running China however they want to), China might be well ahead of many other developed nations in 5 – 10 years in terms of alternative and environmentally friendly energy (if the whole system lasts that long). I choose to live somewhere that has ample year-round precipitation. My house has an integral roof fed cistern which I want to enlarge from 500 gallons to 2500 gallons. It’s the source of all water for the house. I drink and cook with it after feeding the water through a Berkey using their white ceramic filters. Most of the rain that hits my roof overflows the cistern but expanding my capacity would extend my ability to handle dry weather stretches that happen from time to time. I am surprised that more people don’t use systems like mine. Jay, I’m not a wild-eyed environmentalist, but do believe in wise use of our resources. Not wholesale waste. And yes, those who “have” tend to be profligate. And another yes, America got to its rich status because resources got trampled upon and exploited, that should not have. But we are going too far the other way. Humanity should be the priority before some obscure minnow. Species have naturally become extinct for millennia, and we had nothing to do with most of it. A third yes–China is now changing some policies because those in power are being affected. The rich can afford the luxury to consider the environment after they are comfortable. Like in Africa–it is hard for poor villagers to observe “protected species” laws when poaching means your family will eat today. @wildartist I agree with you. Especially considering most environmentalists still use planes to fly on holiday, use a lot of technological gadgets that produce a lot of toxic waste being produced and so on. We try to get more people in our area to grow organic vegetables but its obvious they will not do this for environmental reasons if this means their family has to starve for 2-3 months instead of growing with pesticides and other chemical agents and selling their produce for more. So our goal is now to help them sell directly via us (and we work with an organic agriculture department of a local university) to organic supermarkets in major cities that pay premium prices. You can only expect them to change if they do not lose more money.